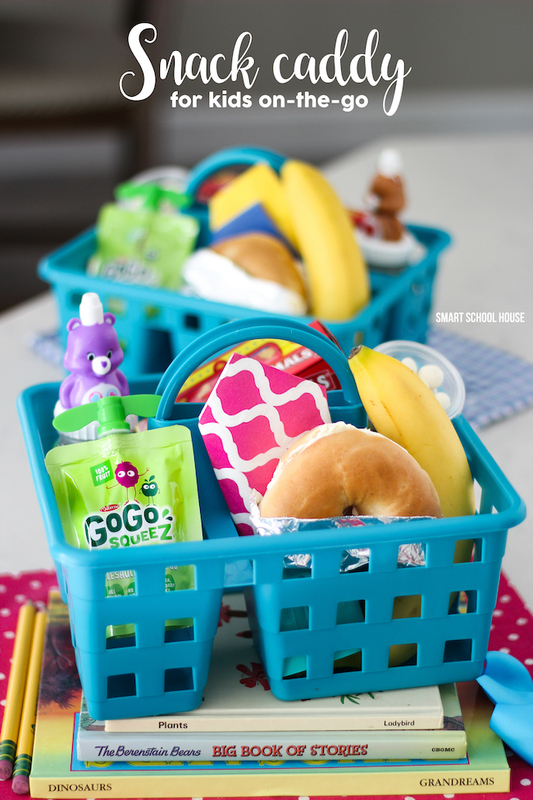 Make a snack caddy for kids on the go! Today we are sharing a smart after school snack ideas for busy kids and families. Use a shower caddy and fill it with great snacks, like a GoGo squeeZ® applesauce, to keep your busy kids fed on the go. Oftentimes, the hours after school fly by because we all have so much going on: sports activities, camps, play dates, tutoring; you name it! As a mom of two elementary aged kiddos, I can admit to spending a lot of time on the road after school. My kids are actually hungry the moment that dismissal bell rings! What are your go-to snacks when you’re headed out to soccer practice, dance classes, or homework clubs? Ours usually include some crackers, something to drink, and a GoGo squeeZ® applesauce. If I know we won’t be home until close to dinner, I’ll pack a few more things. What makes a snack caddy so perfect for snacking on the go? 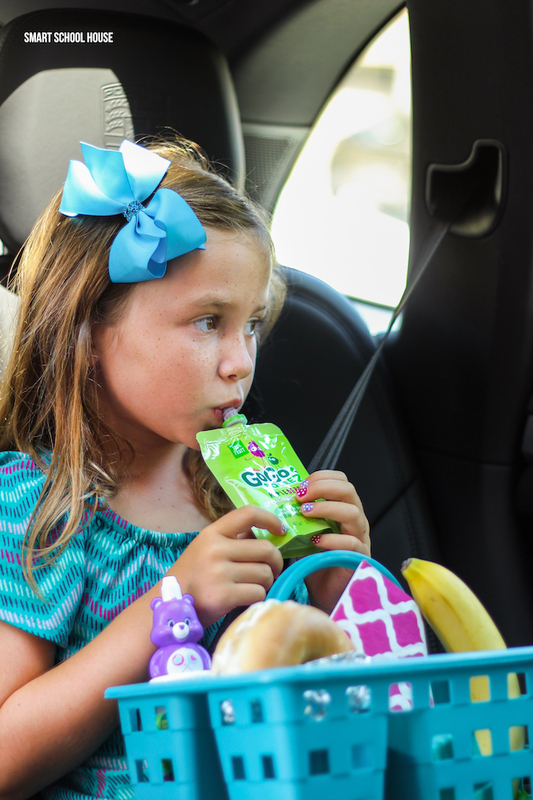 Kiddos can munch on the snacks in the car, at the park, or wherever you happen to be! The basket is actually a shower caddy with separate compartments and a handle. It’s great for passing around in the car and the compartments keep things from spilling all over like a regular lunch pail. When I’m making lunches in the morning, I’ll start tossing things into the snack caddy for after school as well! If your kids have anything they didn’t eat in their lunch pails at school, put those unopened items in the snack caddy for the afternoon! 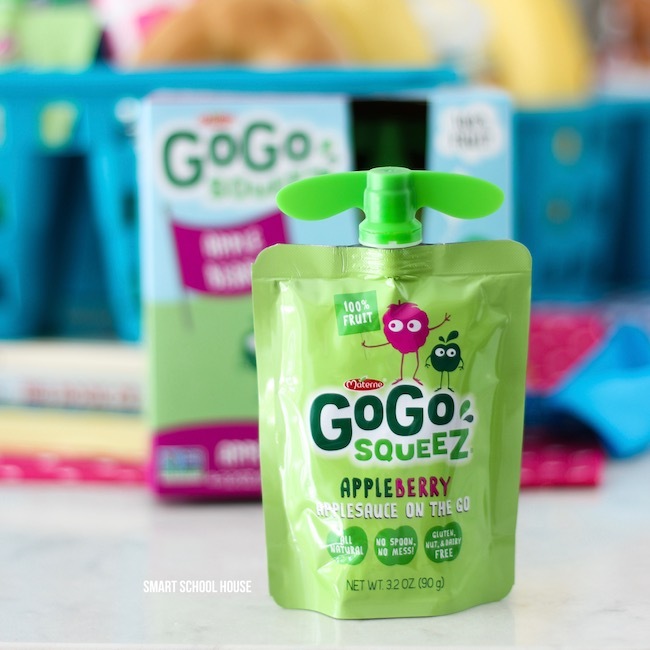 For a tasty on the go snack, my kids love GoGo squeeZ® applesauce. It is 100% fruit and contains no artificial ingredients. We tend to rotate through the flavors like AppleApple, AppleStrawberry, AppleBanana, and AppleBerry. I usually purchase a few different flavors, in packages of 4, for less than $3.00 each at Target or Walmart. They are also available at most major grocery stores. 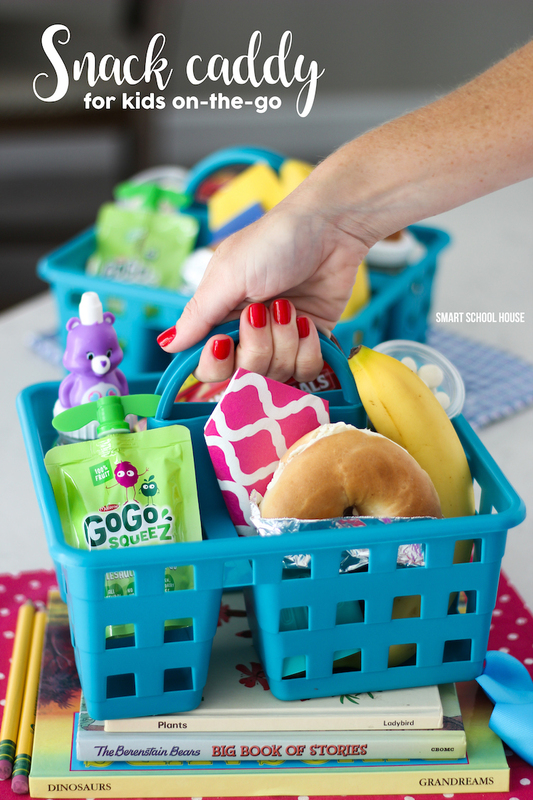 A GoGo squeeZ® applesauce can go straight from the box to the snack caddy for a super tasty after school treat! Now that’s goodness on the go. It can become hard to keep snacks and treats healthy on a day-to-day basis. The last thing I ever want to do is end up in that drive-thru line because we’re all so starving in the car (been there, done that!). Using a snack caddy is an easy way to keep food organized and nourishing while on the go! What is your favorite GoGo squeeZ® applesauce flavor? Tell me in the comments for a chance to win a $100 Visa gift card! I am an original girl…AppleApple!!! Ahhh the cinnamon apple..sooo good!! My favorite is cinnamon apple too! We love Apple Raspberry Lemon Twist! My son and I love Apple-Mango! We love Apple Berry at our house!!! Apple Banana is my favorite. The Apple Cinnamon flavor is my favorite. I love APPLE RASPBERRY LEMON TWIST. My favorite GoGo squeeZ® applesauce flavor would be the apple banana. My favorite flavor would have to be apple cinnamon! My kids love the original apple ones. 🙂 Thanks for hosting the giveaway. We’ve not tried these, but I suspect I’d like AppleBerry. The AppleCherry sounds like my kids would love this flavor. Thanks so much. My kids like Apple Berry. I’ve never actually had it before. I haven’t tried it, but Apple Raspberry Lemon Twist sounds wonderful! My favorite flavor would be the APPLE	CINNAMON. My favorite flavor is Apple Cherry. The Apple Cinnamon flavor sounds really good. My daughter’s favorite flavor is apple banana! She loves Go Go Squeez! My fave is the apple apple sauce. I love the Apple sauce to go. They come in all sorts of flavors. I love apple sauce, my fav ! My boys love the Apple Banana. my favorite flavor is the apple strawberry! Apple Cinnamon is our favorite! My grandson loves all the flavors! My family loves the GoGo Squeeze apple/strawberry! A great snack and an add on to breakfast!! I want the apple berry flavor. Looks pretty good. apple cinnamon is the best! Apple Raspberry Lemon Twist sounds great. I haven’t had any of the GoGo squeeZ flavors yet but I would love the Apple Berry. We love the Apple Pear! Favorites would be Aople Banana and Apple Peach. I like the APPLE RASPBERRY LEMON TWIST. I like the Apple Pumpkin Spice flavor. My favorite flavor is Apple Banana. I have to go with the cinnamon apple! Thanks for the chance to win! My favorite GoGo squeeZ applesauce flavor is the famous Apple Strawberry flavor. One favorite is the Apple Cinnamon and while browsing the site I saw they have a limited batch Apple Pumpkin Spice that sounds really good and will be looking for it on my next trip to the store. Apple Cherry is the best.